United Provinces, Chili & Patagonia. Buenos Ayres, Chili & Patagonia. 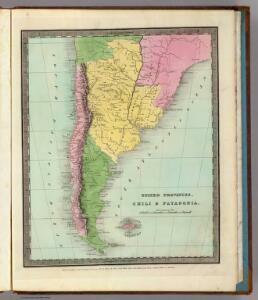 Carte du Paraguay, du Chili, du Detroit de Magellan &c.
1 : 10200000 Tanner, Henry S.
South America and West Indies. 1 : 10500000 Tanner, Henry S.
South America - southern section. 1 : 8989200 Johnston, W. & A.K. 230-231. South America, South. The World Atlas. 1 : 7500000 USSR (Union of Soviet Socialist Republics). Paraguay, Chili, Detroit de Magellan &c.
Chile, Terra del Fuego &c.
Der Sudliche Theil Von Sud-America. Map of Chili, Patagonia, La Plata, part of Brasil. Perou, Chili, Amazones, Bresil, Paraguay.